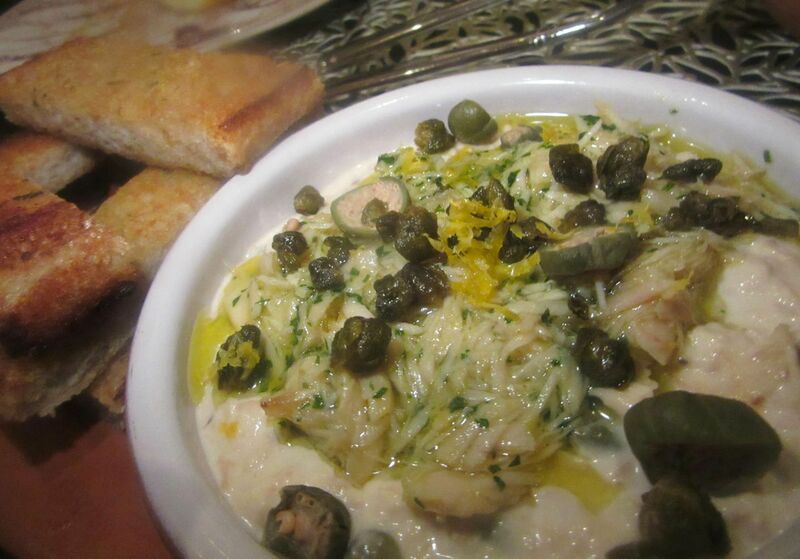 Exquisitely-cooked cod with clams conserva in garlicky salsa verde is my must have. Patatas Asturianas above. I’m not a Food Network fan. I haven’t watched Iron Chef for a long time. Gladiator Jose Garces may be a video hero and a star in Philadelphia, but that’s not what brings me to Ortzi so quickly. 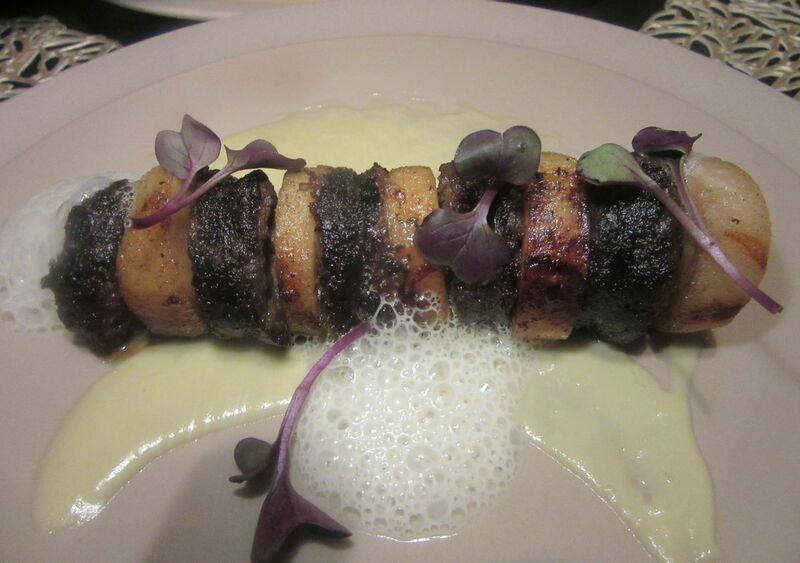 It’s the memories of Amada, Garces’ ambitious spot downtown. I like the tapas there and daydream now and then of our intemperate pig roast. 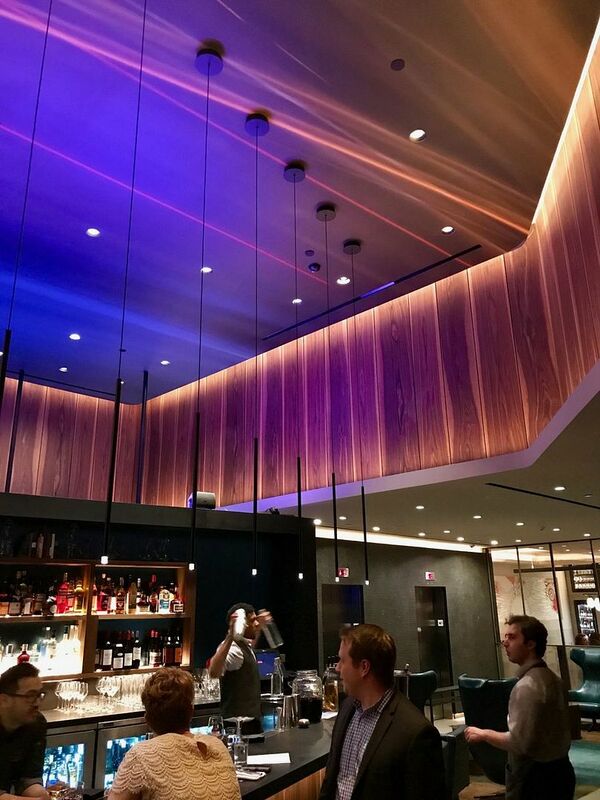 Luma Hotel guests and 41st Street regulars can order Ortzi tapas at the bar. Photo by Dana Stoddard. Amada is a wildly noisy, major design scheme that took forever to open. Ortzi, by comparison, is a modest 50-seat effort in a small hotel on West 41st Street, though its dramatic bar could see action so close to Times Square and Broadway. Yvonne Choy at CCS-Architecture did the design. In Basque mythology, Ortzi refers to heaven or the glow of the sun. 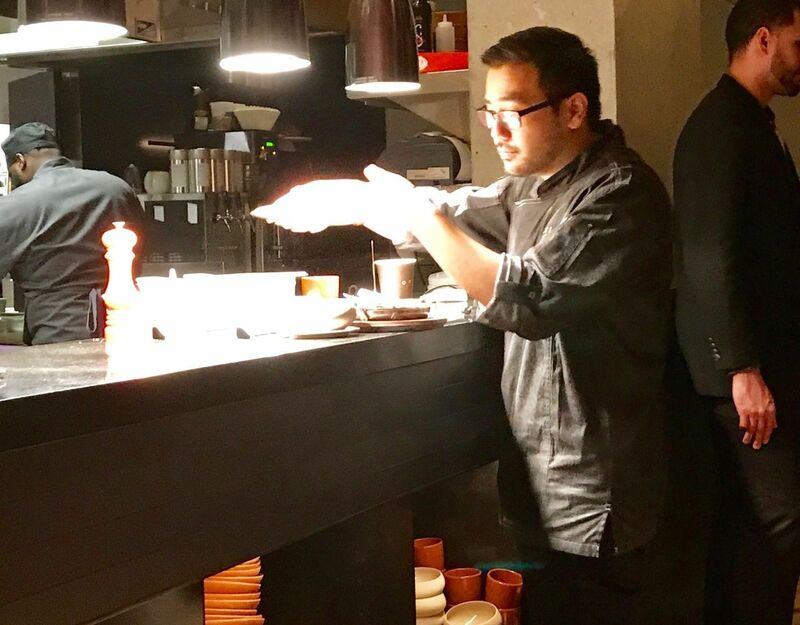 Ortzi’s chef expedites orders in full view of the modest 50-seat dining room. Photo by Dana Stoddard. The kitchen, carved out of this restricted space, is so small that the expeditor stands in the dining room directing the flow, with piles of dishes stacked in full view at his feet. 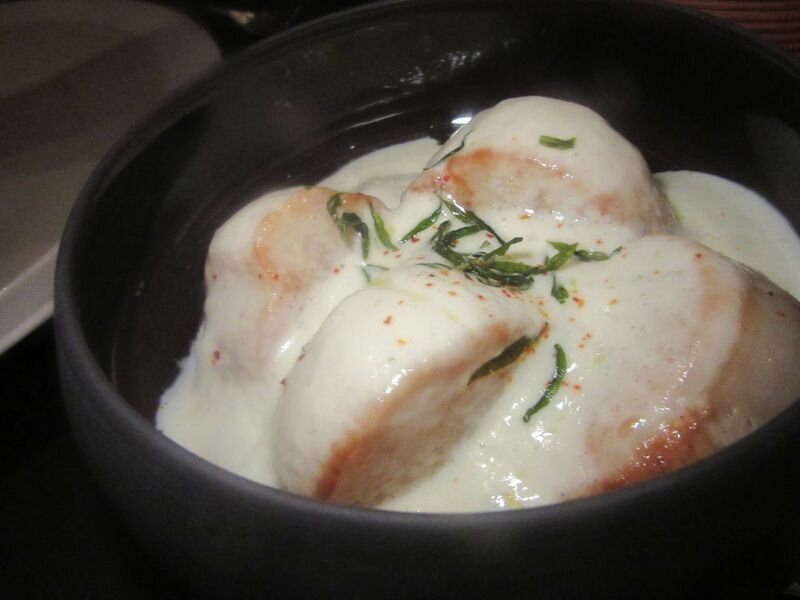 But Chef Michael Han’s menu is loaded with delicious surprises, Basque style tapas, casseroles and grills. 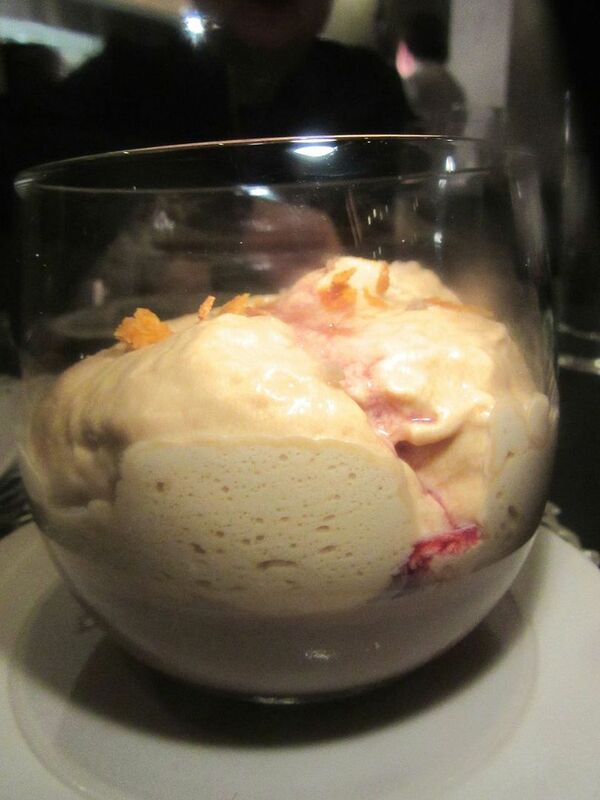 I start sending friends there after just two dinners, pleased and excited by almost everything I’ve tasted. Except for some over-salting. Pan de queso, cheese bread, with tomato crème fraîche sauce alongside, sprinkled with espelette pepper. Not many of the 50 seats are occupied that first evening, as we settle at a matte black table with an odd plastic doily in the middle. An occasional solo diner might be a hotel guest too lazy to venture out. Is this music a little weird? I ask my companions. It’s mostly repetitive sounds. I decide I like it. Then it morphs into guitar. My pals, meeting for the first time, are getting acquainted, and urge me to handle the order. The waiter excuses himself as a brand new arrival from the middle west. Photo by Dana Stoddard. The waiter is a freshman too, from the middle west, he confides, explaining that’s why he doesn’t know the answers to any of our questions. He wears a dark vest over a striped shirt with silly red fabric strips that button to hold the rolled sleeves in place. A uniform, aspiring touch for just 50 seats. 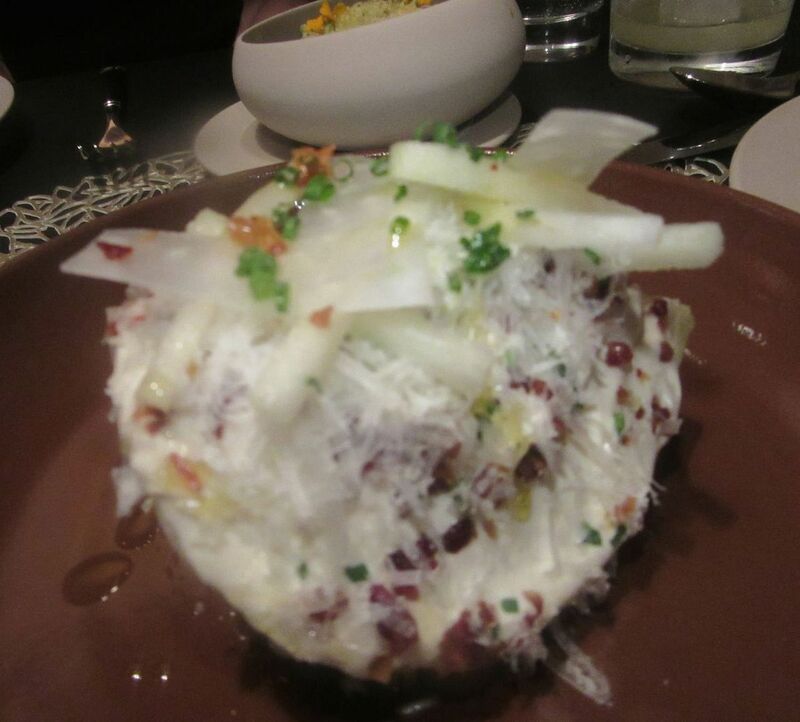 From the look of this indulgent amuse of the menu’s crudos, I can guess someone has recognized me. 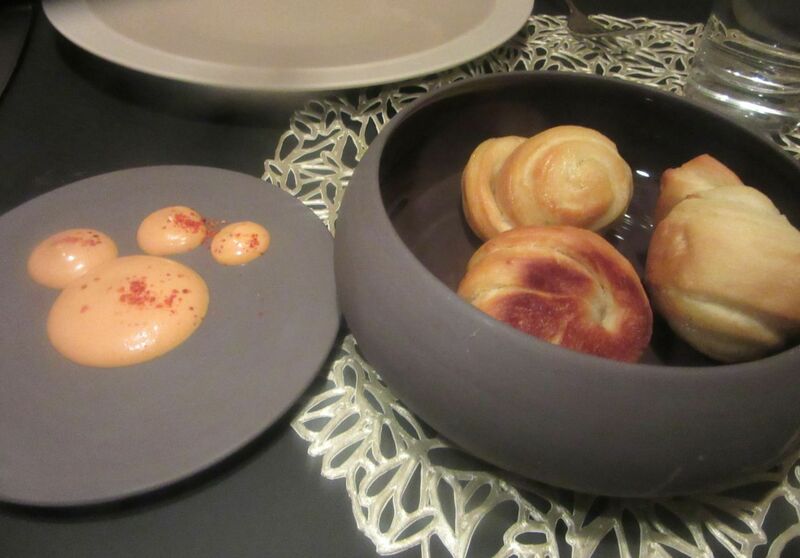 Small folded cheese buns (pan de queso) arrive accompanied by a sauce of tomato crème fraîche sprinkled with espelette pepper in grey earthenware. Not just pretty, but delicious. We are debating asking for more when a generous amuse arrives. 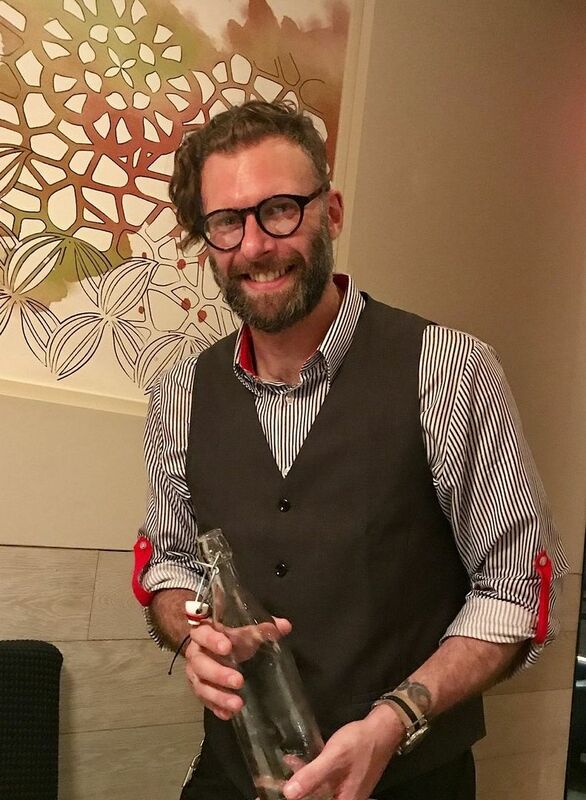 Three curls of raw fish, miniatures of expensive crudos on the menu. 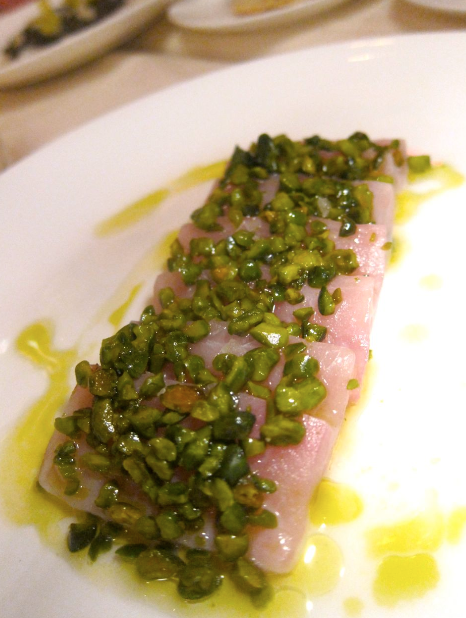 Toro Bluefin belly painted with olive oil and sprinkled with caviar. 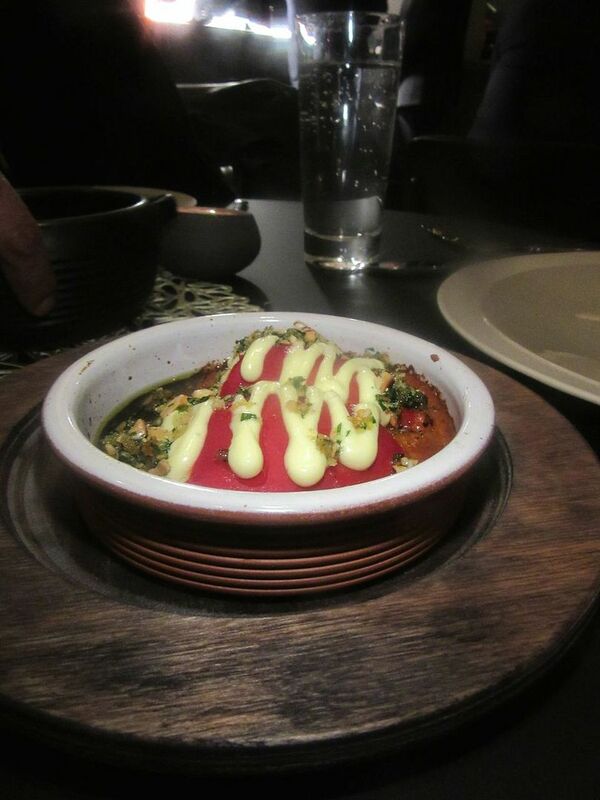 Hamachi with piquillo pepper in a saffron emulsion. And fluke with chickpea powder, lemon, and sea beans. 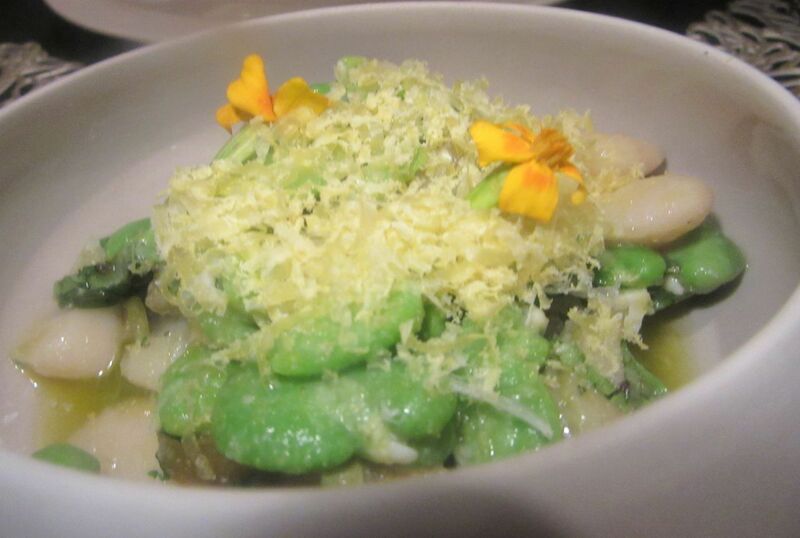 The lemon-tossed favas with Gordal olive chunks are dotted with a duo of mirco marigolds. 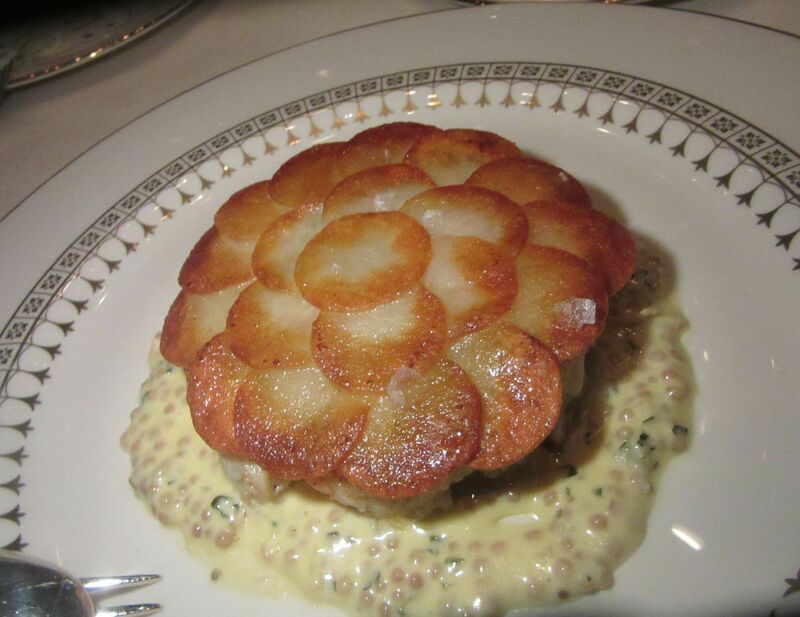 Each small coil with a different little green topping it off is so complex, I can only taste in slow motion – the savor of fish, the oil filling my mouth, a pinch of green emerging, the accent of lemon, the fat cling of caviar. Caviar! I suppose I’ve been recognized. Cockles come tossed on potato puree with pine nuts, chorizo, onion and radish on sourdough toasts. I’ve deliberately chosen mostly vegetables over raw fish, except for the delectable cockles with chorizo, potato puree and pine nuts. Already I am promising myself…next time. I want to taste everything. 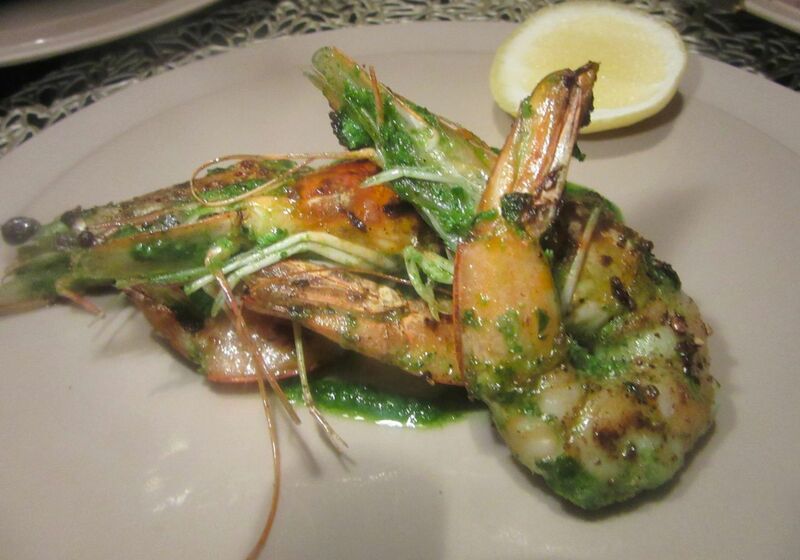 A trio of disappointingly small Spanish prawns are nicely dressed in a feisty garlic-lemon sauce. “There are only three,” the waiter warns when I order the gambas. “And we are three,” I remind him. But he’s right. 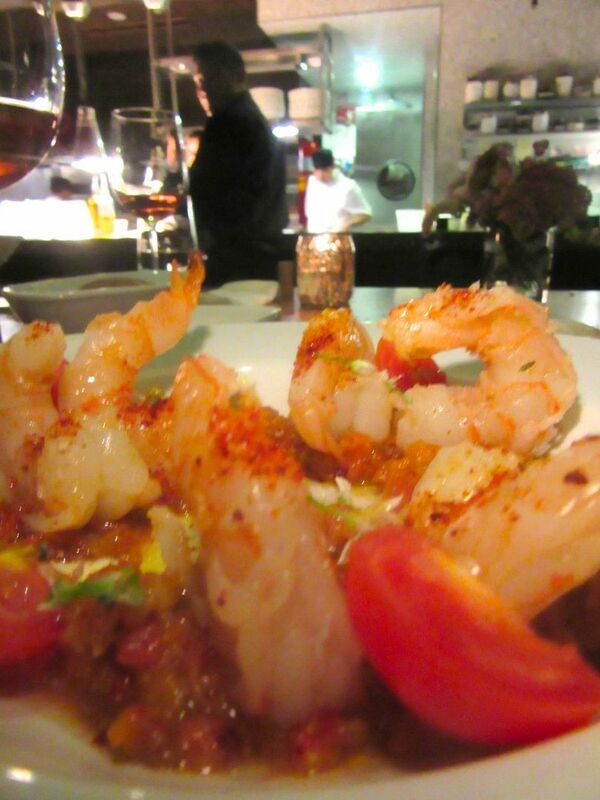 The garlicky Spanish prawns are not just few. They’re small for $19. 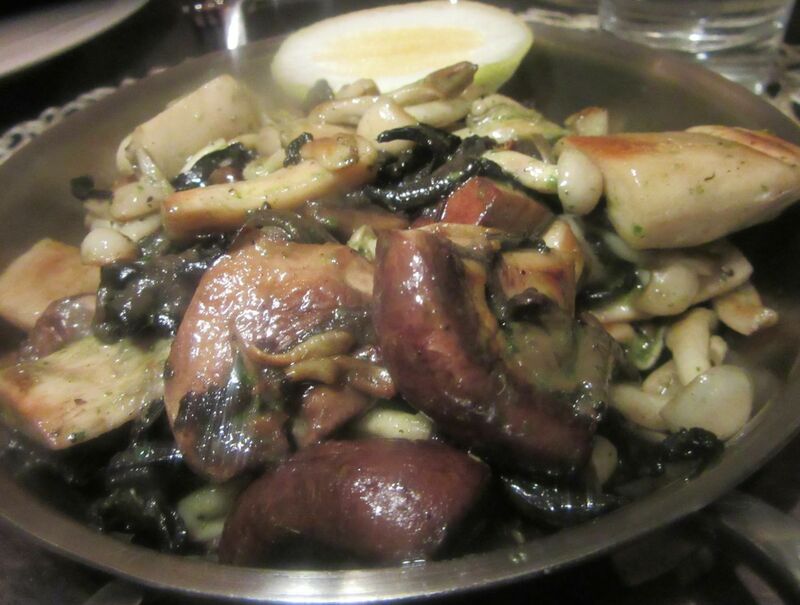 The mushroom collection is full of the spring harvest, slicked green with parsley olive oil. Wood-roasted cabbage gets a boost from manchego, bits of pig jowl and anchovy dressing. More olive oil, vibrant from garlic and lemon, green with parsley, slicks an impressive collection of mushrooms: hen of the woods, oyster mushrooms, beech, and baby cremini. So many different textures. Favas are tossed with lemon, Gordal olive chunks, smoked egg yolk and dotted with a pair of micro marigolds blooming in grated feta. Even a humble wedge of wood-roasted cabbage come alive with manchego, bits of pig cheek, and anchovy dressing. The crispy patatas Asturianas are lively too. Discs of blood sausage alternating with apple look like a necklace to me. My pals are game to try it. I’m a fan of blood sausage in any guise. Tonight it comes in small discs forming a necklace. My friends want to know what they’re eating. I let them taste the roasted apple rounds against the rich meat on its onion sauce, and collect their positive umms and yums, before I tell them. The oxtails are so salty we send the back. I suspect it’s too much of that last minute pinch of finishing salt. 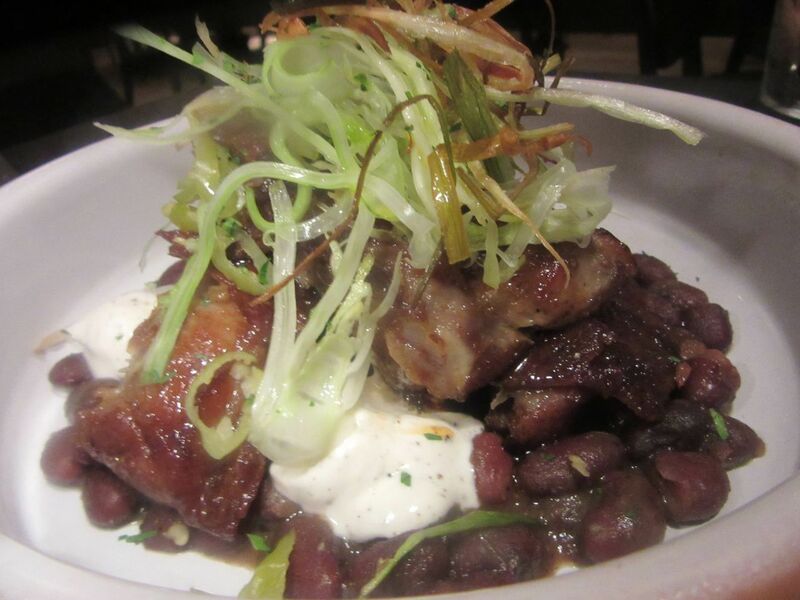 The pork rib dish with meaty Bacque black beans is a bit salty too but we’re savoring it anyway. 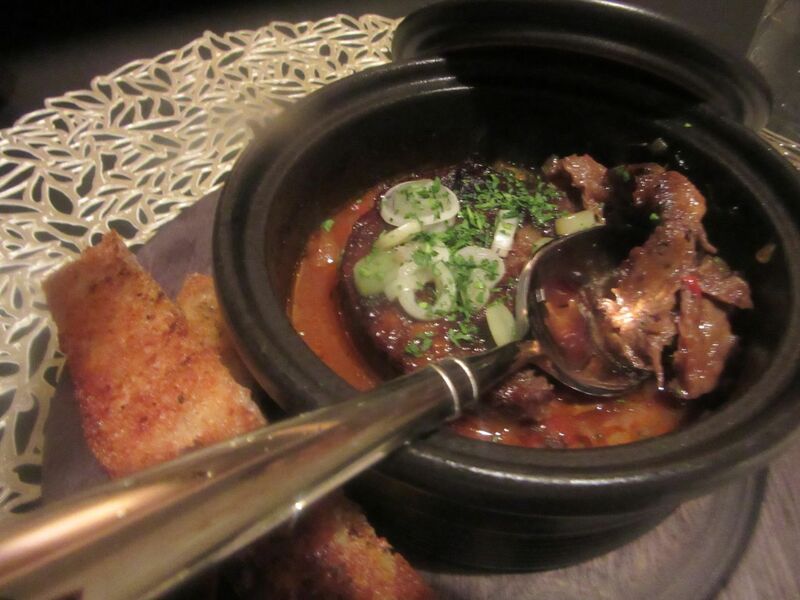 As a reward, I give them braised oxtails with chickpeas, and a cazuela of pork ribs piled atop alubias de Tolosa – meaty Basque black beans –with guindilla peppers and curls of raw fennel, both of them salty. In fact, we send back the oxtails with a complaint to our just-hatched server, who should have removed them from the check. 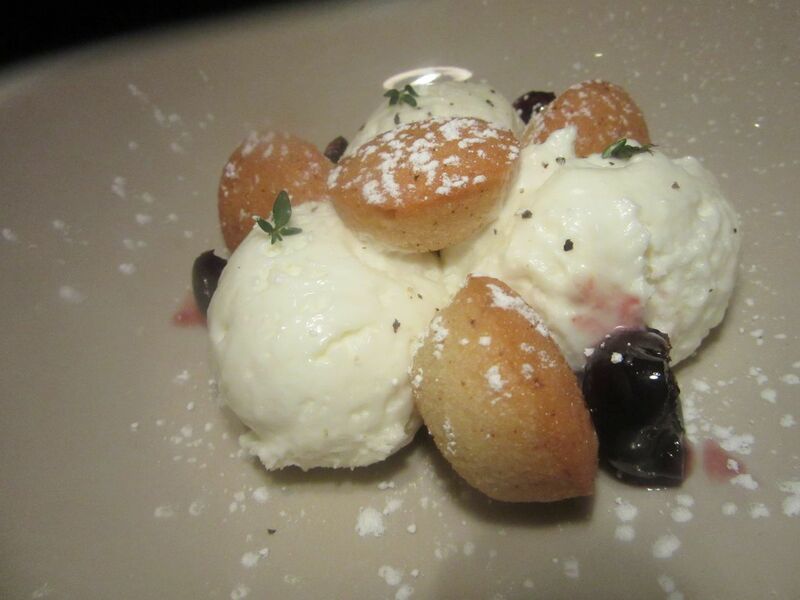 Our waiter gives dessert as a gift: Goat cheese cream, almond cake and red wine caramel with roasted cherries. Instead, he doesn’t charge for the dessert we’ve ordered: a luscious mound of goat cheese cream, almond cake, red wine caramel, and roasted cherries. 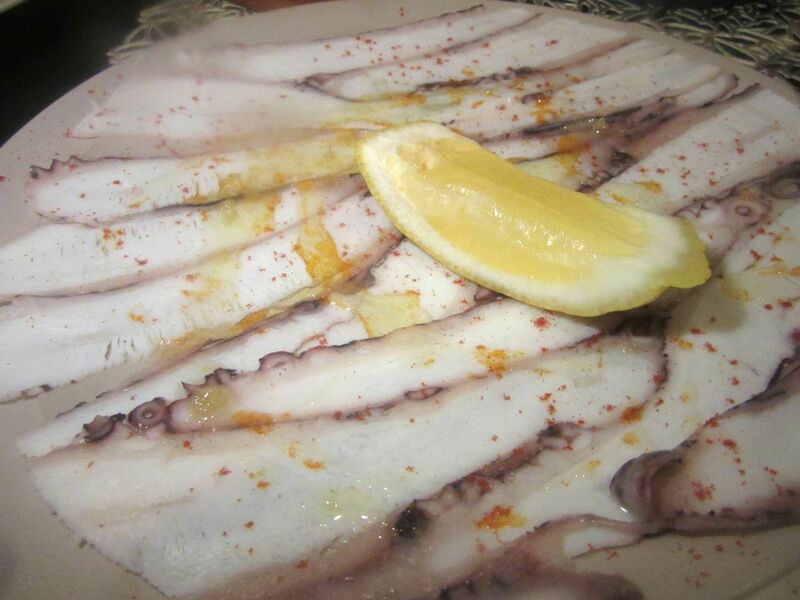 The carpaccio of octopus has no oomph at all. It’s beautiful but the only dish we didn’t like. 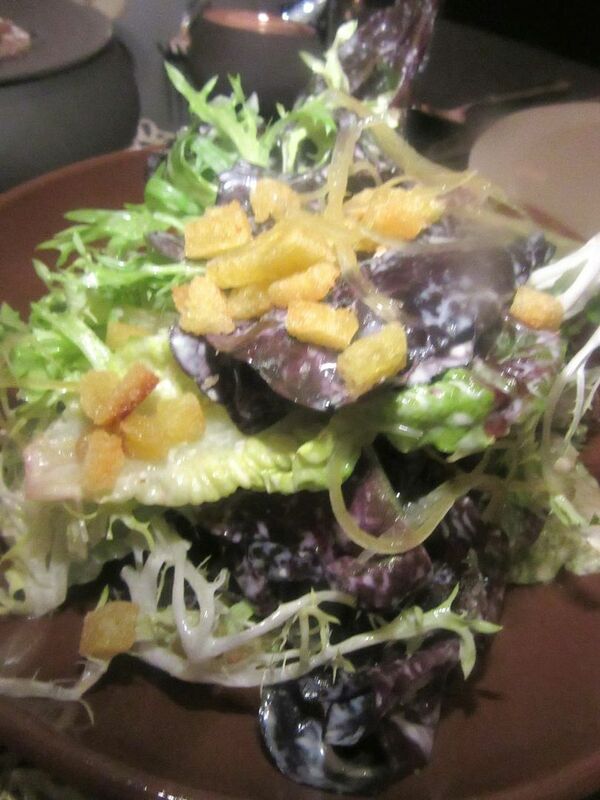 The salad of local lettuces and brioche croutons gets all the salt it needs from Cabrales blue cheese dressing. Different friends are equally eager to let me order and seem puzzled when the first dish that arrives is only a salad, mostly lettuces with brioche croutons. It seems a bit too salty, but I’m guessing that’s the Cabrales blue cheese dressing. There’s a choice of three: Jerez vinaigrette might have been less salty. 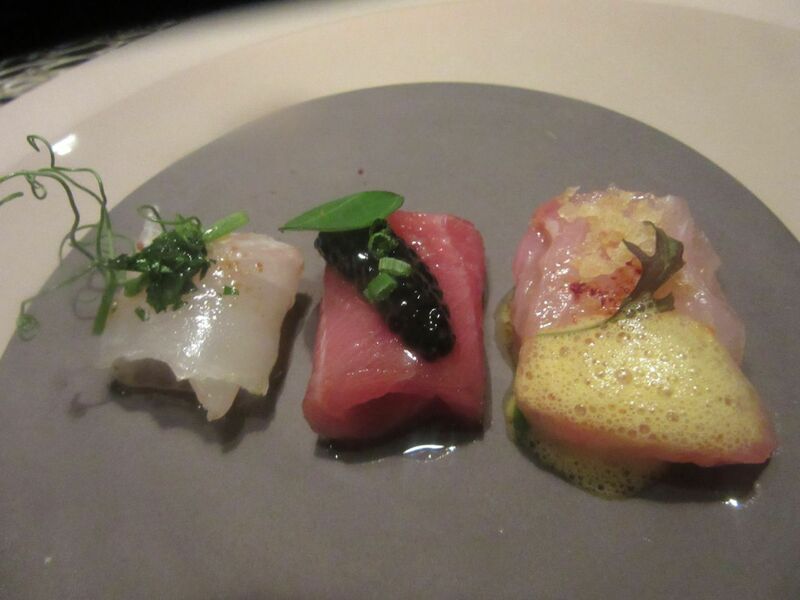 The waiter thought we meant to order the Bluefin toro crudo with caviar. So we got that too. I’m wild about this preserved tuna belly remoulade to spread on sourdough toast. 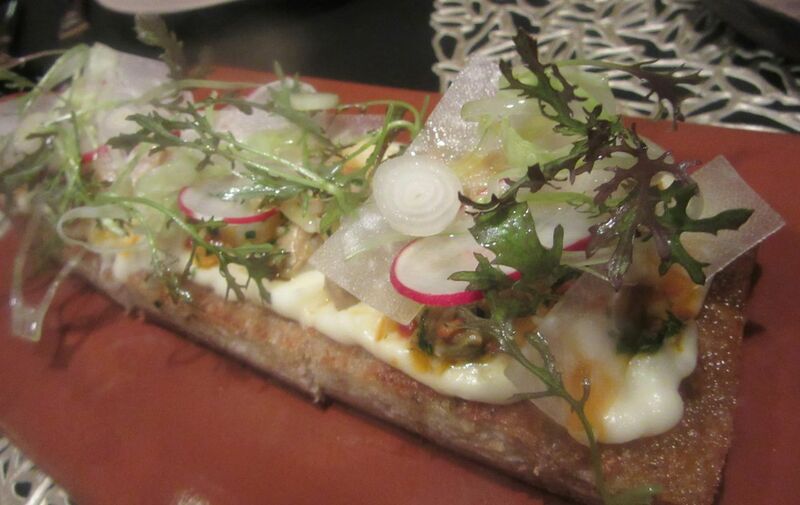 I’m curious about the canned tuna belly remoulade meant to spread on crustless garlic sourdough toasts. 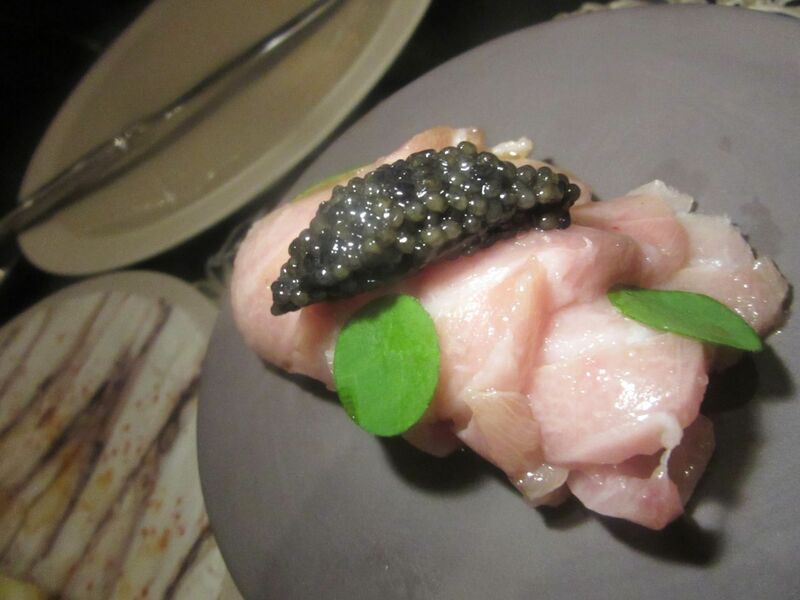 But the waiter hears tuna and bring the $28 bluefin toro belly with caviar instead. Both are wonderful, but he probably should have charged for the $16 dish I actually ordered, and not the $28 dish he brought. Scallops with diced Serrano, pickled ramps, savory herb oil and Marcona almonds from the $75 tasting menu. A very pretty classic of peppers stuffed with bacalao. Clearly the house knows it’s me. I’d like to think that any returning enthusiast would get the same welcome, especially when the house is trying to recruit regulars. Now, they deliver a gratis scallop dish in a creamy sauce that is part of the chef’s $75 tasting: exquisitely-cooked, but too salty to eat. If I see crispy patatas on the menu, I’ll order them. 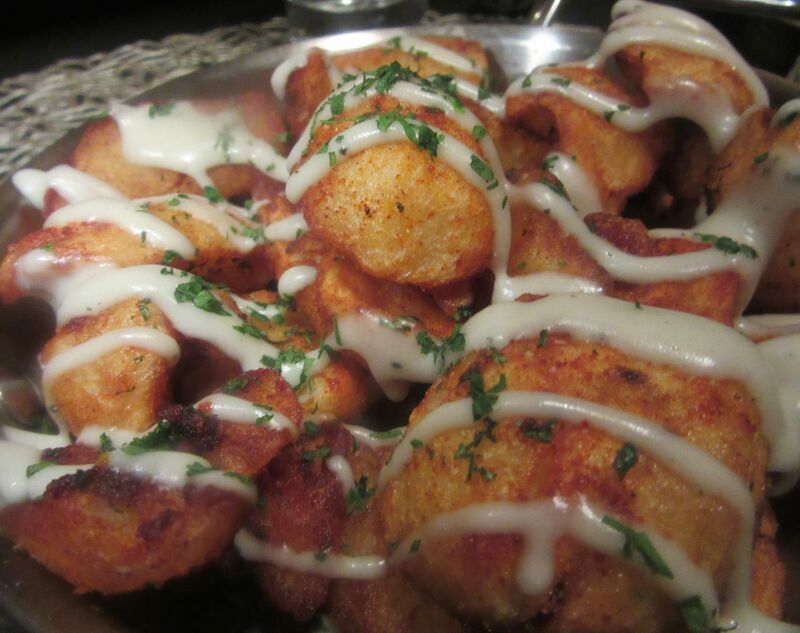 These are Asturian-style with tomato sauce and aioli. We share everything, of course. The wood-roasted poussin, served cut up on grits with corn, a chili after-burn, and a quail egg. A duo of piquillo peppers are stuffed with bacalao under a flurry of slivered almonds. The braised oxtail with chickpeas is another extra from the kitchen. I’ve ordered crispy patatas Asturianas again, of course. Copa caramel: Milk chocolate cream with caramel foam. sweet wine, orange and a sprinkle of sea salt. But the triumph of the evening is voluptuous black cod in salsa verde, served with miraculously perfect little cockles (from a can, I’m told later) on potato puree and pine nuts. 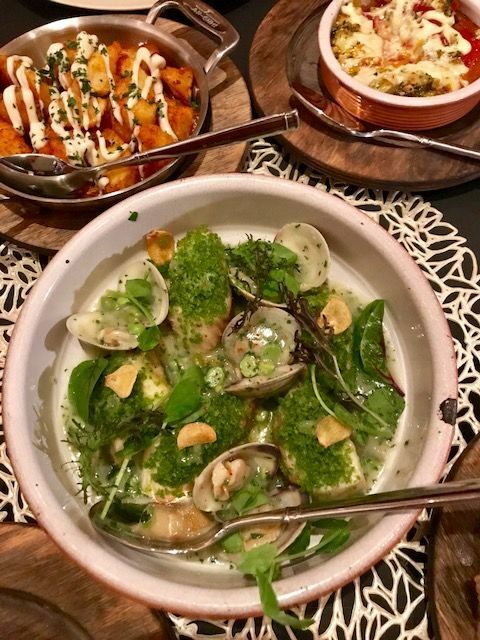 I taste it again and again to savor the pure essence of the fish, lightly cooked the way I always dare to hope, and swirled in a green pea clam juice, a dramatic mix of land and sea. 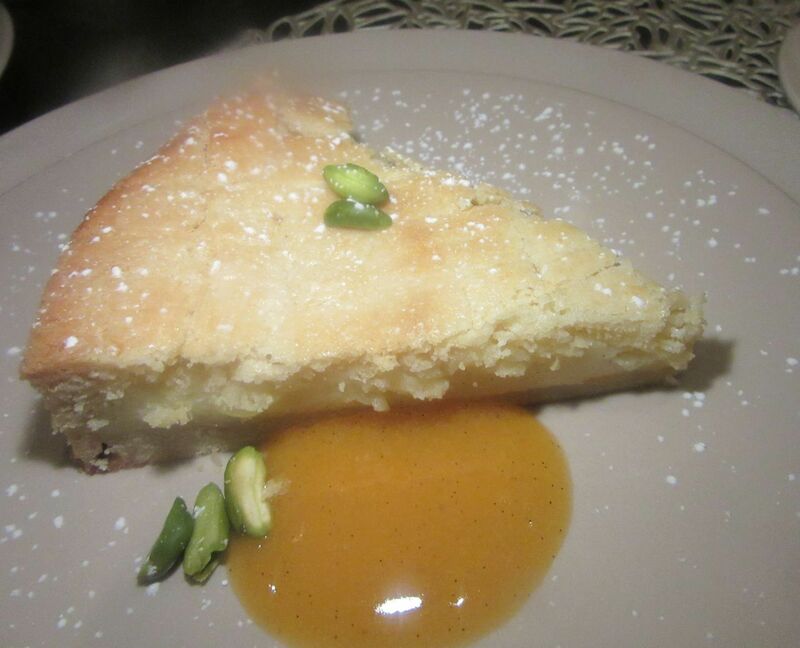 Pastel Vasco, the Basque-style custard tart, is made with apricot, olive oil and pistachio cream. The three of us share the Pastel Vasco -- a Basque style custard tart with apricot, olive oil and pistachio cream – and the Copa Caramel – milk chocolate cream with caramel, the sweet wine Pedro Ximenez, orange and sea salt. My friends live in SoHo and usually walk to dinner at a few favorite places nearby. But when they travel overseas, they explore, carrying lists of places recommended by food-obsessed pals. Tonight they’re thanking me for a dinner of surprises on a block they’ve never come to. That is just the first act of what I hope will be fine drama at Ortzi. 120 West 41st Street between Sixth Avenue and Broadway in the Luma Hotel. 212 730 8900. Breakfast Monday through Friday 7 am to 10 am. Saturday and Sunday to 11 am. Lunch daily 11:30 am to 2:30 pm. Dinner daily 5 pm to 11 pm.